"The next generation of Lowepro's active outdoor pack design is built for photographers and adventurers who like to go fast and light with their gear. An updated, side-access UltraCinch chamber allows you to tighten the camera compartment from the outside to help stabilize gear while you're in motion. An ActivZone harness provides targeted support. 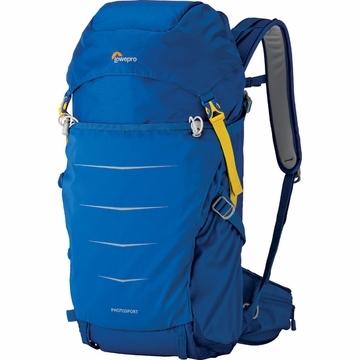 Multiple attachment points allow you to secure extra gear to the pack, such as a tripod or trekking poles and the front pocket accommodates a bike helmet, light jacket, gloves, etc. Dimensions: 10.6 x 9.4 x 22 in"